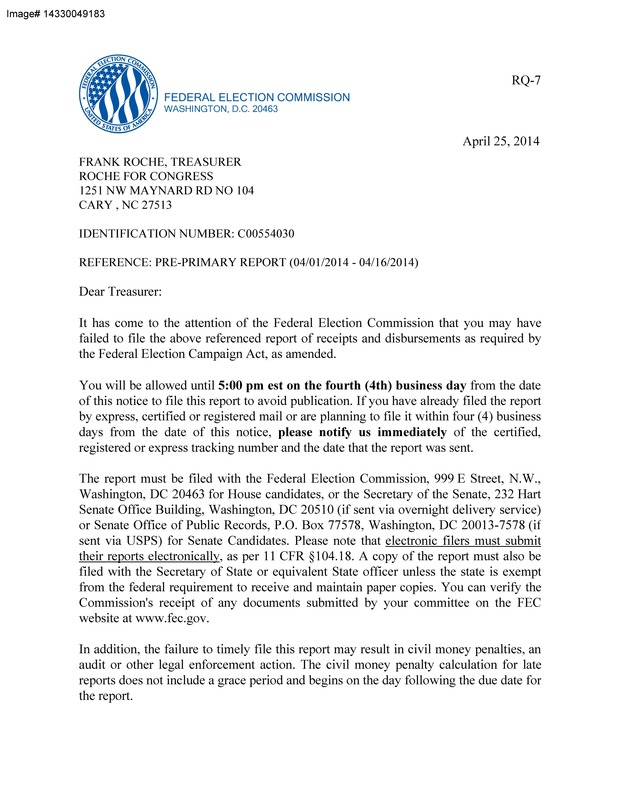 At the Carolina Review, we have received evidence that Candidate Frank Roche, Republican primary challenge to incumbent Republican Renee Ellmers has failed to file his pre-primary report to the Federal Election Commission in the race for NC-02. The letter states that Roche has “four business days” to complete the filing or face “civil penalties, an audit, or other legal actions.” The letter also names Roche as the treasurer of his own campaign committee. While this is legal according to the FEC, it does raise questions as to why he has yet to file his report. Roche received the notice on April 25, 2014, meaning he has until tomorrow, May 1, at 5 P.M. to file. Good way of explaining, and nice article to take facts concerning my presentation subject matter, which i am going to present in college.